The Boomtown Rats are an Irish rock band that had a series of Irish and UK hits between 1977 and 1985. The group is led by vocalist Bob Geldof. The other members of the original line-up were Garry Roberts (lead guitar), Johnnie Fingers (keyboards), Pete Briquette (bass), Gerry Cott (rhythm guitar) and Simon Crowe (drums). The Boomtown Rats broke up in 1986, but reformed in 2013, without Johnnie Fingers or Gerry Cott. Most of the six members originate from Dún Laoghaire, Ireland; Pete Briquette was originally from Ballyjamesduff, County Cavan, Ireland. 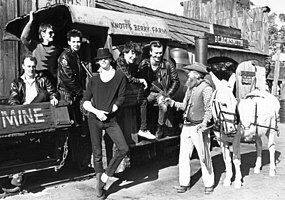 Having been booked for their first gig under the name The Nightlife Thugs, the group agreed to change their name – when Garry Roberts threatened to resign if they were called that – to The Boomtown Rats, after a gang of children about whom Geldof had read in Woody Guthrie's autobiography Bound for Glory. They became a notable band, but one whose accomplishments were overshadowed by the charity work of frontman Bob Geldof, a former journalist with the New Musical Express. In the summer of 1976, the group played their first U.K. gig in London followed by gigs in the Netherlands (Groningen and The Milky Way Club in Amsterdam) before moving to London where they signed with Ensign Records later that year. Their first single, "Lookin' After No. 1", came out in August 1977. It reached the Top 40 of the UK Singles Chart, the first of a long string of successes. The album The Boomtown Rats was released the following month; it included another single, "Mary of the 4th Form". Music journalist Martin C. Strong commented, "Geldof's moody charisma helped to give the band a distinct identity". Their next album, A Tonic for the Troops (1978), featured three hit singles, "Like Clockwork", "She's So Modern" and "Rat Trap". The US version of the album (with a slightly different selection of tracks) came out the next year on Columbia Records. Mutt Lange produced "Rat Trap", which became the first rock song by an Irish band to reach No. 1 in the UK. In addition, "Rat Trap" was also the first new wave song to claim the number one spot. In 1979, "I Don't Like Mondays" was released. This was written in response to a school shooting in California carried out by Brenda Ann Spencer, and also reached No. 1 in the UK. It was a worldwide hit, with the exception being the United States. It was the band's only song to reach the US Billboard Hot 100 and was included in the band's third album, The Fine Art of Surfacing. The album also contained "Diamond Smiles" and their next Top 10 hit in the UK, "Someone's Looking at You". In 1980 "Banana Republic" was released, which was their last Top 10 hit, and in the following year the Boomtown Rats' next studio album Mondo Bongo was issued. Cott departed from the band at this point. According to Bob Geldof's autobiography, Is That It?, Cott had grown disillusioned with what he saw as the band's growing laziness in the studio, and their apparent relinquishing of their early R&B influences in favour of "cod-reggae". Throughout his time with the band, Cott had maintained a distance between himself and the other members and he resigned the day before the end of their 1981 world tour, only hours after the rest of the band had decided to confront him for refusing to join them and the road crew for a drink to celebrate Simon Crowe's birthday. Cott had a short-lived solo career, releasing two UK singles, "The Ballad of the Lone Ranger" and "Pioneers" and the 1984 Canadian single "Alphabet Town". The band's fifth album, V Deep, was released in February 1982. The first single was "Never in a Million Years" which did not sell well, while the follow-up "House on Fire" made number 24 in the UK Singles Chart. In the US, the album was initially rejected by their American label, which instead issued a four-song EP called The Boomtown Rats, featuring four selections from V Deep. The full album was eventually issued in the US in late 1982. A follow-up album entitled In The Long Grass was recorded in 1983, but was initially rejected by the group's label. By 1984, the band was touring universities after becoming unable to fund the "guarantee" required to book mainstream concert halls. In The Long Grass was finally issued in the UK in May 1984, but failed to chart. Two singles, "Tonight" and "Drag Me Down", were taken from the album; these reached the lower rungs of the UK Singles Chart, but two further singles, "Dave" and "A Hold Of Me", failed to hit the UK top 75. The Boomtown Rats' involvement with Band Aid (on which they all played) raised their profile again, and in January 1985, a revised version of In the Long Grass was finally released in the US. The album made the US charts at #188, but the associated singles failed to make an impact on the charts or on the radio. The band subsequently performed at Live Aid's charity performance. "Dave", a single from the original release of In the Long Grass was re-recorded as "Rain" for the US market. The song was about the band's saxophone player and school friend David MacHale (died 2009), who had suffered a breakdown after his girlfriend was found dead in a public toilet next to an empty heroin bag. The 'Rain' metaphor in the altered lyrics referenced Duran Duran's earlier song "Hold Back The Rain", where Geldof's friend Simon Le Bon pleaded with an unnamed band member to cease dabbling with narcotics. After this, the band was mothballed while Geldof wound up his affairs with the Band Aid Trust, during which time he succeeded in getting them a one-album deal with Vertigo Records. However, both Crowe and Fingers refused to rejoin the Boomtown Rats full-time, preferring to pursue their own band, Gung Ho. The band's final performance came at Self Aid, a 1986 concert featuring many Irish rock stars, to raise awareness of unemployment in Ireland. Their rendition of "Joey's on the Street Again" was 12 minutes long, with an extended bridge, during which time Geldof ran among the crowd. Following this performance, Geldof addressed the crowd, saying, "It's been a great ten years; rest in peace". The band then performed "Looking After No.1". Following the band's break-up, Geldof launched a solo career with Pete Briquette continuing to work alongside him. Garry Roberts co-wrote songs for Kirsty MacColl before leaving the music business and going on to become a successful salesman of financial services. Roberts now presents his Guitar Workshop to schools, encouraging pupils to play the instrument and emphasising the contribution of The Blues to modern Rock and Pop music. After Gung Ho split, Fingers became a highly successful music producer in Japan, as well as being part of the Japanese band Greengate. Simon Crowe is in the West Country-based Celtic instrumental band Jiggerypipery and has also run a clock making business. In 2005 the band's albums were all remastered and re-released and a 'Best Of' compilation was released, along with two DVDs. Briquette mixed the live DVD and Francesco Cameli mixed the extra tracks for the re-release of the Boomtown Rats albums at Sphere Studios in London. In 2008, Garry Roberts and Simon Crowe, who had continued playing together in The Fab Four, with Alan Perman (ex Herman's Hermits) and Bob Doyle (who once auditioned unsuccessfully for E.L.O. ), and The Velcro Flies, with Steve (Dusty) Hill and Gavin Petrie, got together as "The Rats", playing their favourite Boomtown Rats songs, with the classic line-up of two guitars, bass and drums. The band was initially fronted by Peter Barton, who has a long history, going back to the early 1980s, of playing with resurrected famous acts, including The Animals, The Hollies and Lieutenant Pigeon. Barton was replaced on lead vocals and bass by Bob Bradbury, who was the founder and main songwriter in Hello. Darren Beale, formerly of The Caves, played lead guitar. Saxophone player Andy Hamilton, who toured and recorded with The Boomtown Rats, including at Live Aid, played as a guest at some gigs. Gerry Cott and Johnnie Fingers were invited to join the band when circumstances allow. Cott attended the Boomtown Rats' second gig (at The 100 Club on Oxford Street, London). Fingers, meanwhile, works for the Fuji Rock Festival in Japan, but plans to join the band on stage when he is in the UK. On 21 June 2009, Geldof, Roberts, and Briquette got together in Dublin to play "Dave", at a party to celebrate the life of Boomtown Rats' close friend and saxophone player, "Doctor" Dave MacHale, who had died of cancer in Frankfurt. "Dave" was a song Geldof wrote for MacHale in 1983, after MacHale's girlfriend died from a heroin overdose. On 20 September 2011, Gerry Cott guested with Geldof, Briquette and the rest of Geldof's band at The Cadogan Hall, London. They played three Boomtown Rats songs together prior to the encores. Cott returned to the stage for the final encore playing on two Geldof solo songs. The Boomtown Rats reformed in 2013. Bob Geldof said, "Playing again with the Rats and doing those great songs again will be exciting afresh. We were an amazing band and I just feel it's the right time to re-Rat, to go back to Boomtown for a visit." In June 2013, it was announced that the band would be embarking on a UK and Ireland tour supported by a new compilation album, Back to Boomtown: Classic Rats Hits. The group performed at the Brentwood Festival in 2016, where Geldof attracted controversy for criticising the audience. In April 2017, the band returned to the studio to record new material for their first studio album since In the Long Grass in 1984. ^ a b c d e f g h i j k l "Biography by William Ruhlmann". Allmusic.com. Retrieved 8 March 2009. ^ a b Strong, Martin C. (2000). The Great Rock Discography (5th ed.). Edinburgh: Mojo Books. pp. 105–106. ISBN 1-84195-017-3. ^ a b c d Roberts, David (2006). British Hit Singles & Albums (19th ed.). London: Guinness World Records Limited. p. 71. ISBN 1-904994-10-5. ^ Rice, Jo (1982). The Guinness Book of 500 Number One Hits (1st ed.). Enfield, Middlesex: Guinness Superlatives Ltd. p. 193. ISBN 0-85112-250-7. ^ Rice, Jo (1982). The Guinness Book of 500 Number One Hits (1st ed.). Enfield, Middlesex: Guinness Superlatives Ltd. p. 198. ISBN 0-85112-250-7. ^ a b "Boomtown Rats". TrouserPress.com. Retrieved 8 October 2015. ^ Roberts, David (1998). Guinness Rockopedia (1st ed.). London: Guinness Publishing Ltd. p. 55. ISBN 0-85112-072-5. ^ "Geldof Reunites With Fellow Rats in Blackrock". Hotpress.com. Retrieved 15 May 2011. ^ "Bob Geldof, Cadogan Hall – review". thisislondon.co.uk. Archived from the original on 17 September 2012. Retrieved 22 September 2011. ^ Jonze, Tim (28 January 2013). "Boomtown Rats re-form for Isle of Wight festival". The Guardian. Retrieved 28 January 2013. ^ Eames, Tom (17 June 2013). "Boomtown Rats announce new 'Classic' album, UK and Ireland tour". Digital Spy. Retrieved 13 September 2013. ^ "Bob Geldof blasts Brentwood Festival fans for wearing Primark clothes". The Daily Telegraph. 21 July 2016. Retrieved 26 October 2017. This page is based on the Wikipedia article The Boomtown Rats; it is used under the Creative Commons Attribution-ShareAlike 3.0 Unported License (CC-BY-SA). You may redistribute it, verbatim or modified, providing that you comply with the terms of the CC-BY-SA.